Many people will know that parts of the western USA are in the throes of a serious drought. The dry conditions over parts of western USA have been mentioned here on HotWhopper a few times (eg here and here and here) and it's been all over the internet. Finally Anthony Watts has written about it (archived here). This is after the Governor of California has declared a drought emergency - while a wildfire raged in southern California during the heart of winter. And the cause of this? Certainly not “global warming” though I’m sure the activist idiots will use every trick in the book to try to create a linkage. The cause is a the Pacific Decadal Oscillation and a weak to neutral and persistent La Niña pattern that some are calling “La Nada”. Recent long-term droughts in western North America cannot definitively be shown to lie outside the very large envelope of natural precipitation variability in this region (Cayan et al., 2010; Seager et al., 2010), particularly given new evidence of the history of high-magnitude natural drought and pluvial episodes suggested by palaeoclimatic reconstructions (see Chapter 5). Low-frequency tropical ocean temperature anomalies in all ocean basins appear to force circulation changes that promote regional drought (Hoerling and Kumar, 2003; Seager et al., 2005; Dai, 2011). Uniform increases in SST are not particularly effective in this regard (Schubert et al., 2009; Hoerling et al., 2012). Therefore, the reliable separation of natural variability and forced climate change will require simulations that accurately reproduce changes in largescale SST gradients at all time scales. So at present, the drought may or may not be exacerbated or precipitated by global warming, but that cannot be definitively demonstrated at present. Anthony is wrong to be so sure of himself. In any case, all weather these days is affected by global warming. If there wasn't this amount of energy in the system, weather would be different to what it is. Whatever the weather, it's against the background of the warmer world. Yesterday, Governor Brown declared a drought emergency, which is probably a bit too late. I don't know what Anthony meant by "a bit too late". But what struck me was that Anthony's article could equally well be described as "a bit too late". AFAIK this is the first time he's mentioned it at WUWT. And remember when last year he replied to a tweet by Peter Gleick about the California drought with: "Big F*&ing Deal" - "it's happened before" - meaning "so what!". Anyway, he's finally changing his tune and acknowledging that it is indeed a "Big F*&ing Deal". It's a bit late though! 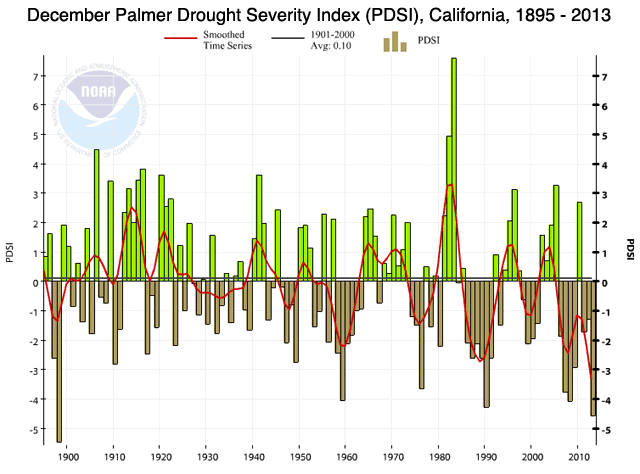 California has been in drought more often than not since the early 1980s. Here is a chart from Jeff Master's blog at wunderground.com. Governor Brown is urging people to reduce water consumption by (another?) 20%. (I believe residential water consumption per capita has dropped a lot in California, following successive public awareness campaigns and imposition of water restrictions. I wasn't able to find any specific data - if someone knows of any maybe they can point to it). The very low residential consumption in Melbourne and Brisbane in particular reflects the severe droughts experienced there at the time, with water storages extremely low, strong water restrictions plus wide public awareness. Remember the table is for 2010. It is likely/possible that per capita consumption in the USA has dropped since then, but I don't know the numbers. Cahill, Ryan, and Jay Lund. "Residential water conservation in Australia and California." Journal of Water Resources Planning and Management 139, no. 1 (2012): 117-121. Schwalm, Christopher R., Christopher A. Williams, Kevin Schaefer, Dennis Baldocchi, T. Andrew Black, Allen H. Goldstein, Beverly E. Law, Walter C. Oechel, and Russel L. Scott. "Reduction in carbon uptake during turn of the century drought in western North America." Nature Geoscience 5, no. 8 (2012): 551-556. Here are a few comments to Anthony's article (archived here). Those models have been predicting an El Nino for a while now. They have no skill unfortunately. We need a pattern change and the high pressure ridge to break down but I don’t see that happening any time soon. There just isn’t enough amplitude right now to break it down. This month the SOI index has moved positive – towards La Nina – both 30day and 90 day averages are trending more positive. So just now any talk of El Nino is a touch creative. Desalination would seem to be good investment if drought is periodic. Personal ones from $1000 to $5000 producing 1 quart to 7 gallons an hour (yachtsmen know these things). ENSO neutral is a mistaken label in my opinion. I have said it before (and may have coined the label) that La Nada/El Nado may be where all the action is and should be studied as much if not more than El Niño/La Nina is. Hot? Jeez, chickens are laying omelets! Ah, Bill Jamison. He was a nasty persistent troll on watchingthedeniers. At least now he's moved to somewhere where his 'insightful' comments will be appreciated. The request to reduce water consumption from the local government is NOT going to go down very well with the gun-toting, suv driving, NO governments goin' to tell ME what I can and cannot do, denizen of his blog. How many times have Tony's acolytes said they want to pay "no stinkin' taxes". But then at the first wild fire or drought they want the government to step in and rescue them. Tony's blog is descending into true fundamentalist agw denying style. There are so few dissenting voices he allows to post these days the blog is turning more extreme and scientifically wrong each day. It is truly sad that he has so many followers and is now believed more and more by the press. I find it amazing that obvious defamations are allowed to be posted and also very sad that to fight these is so expensive. Watts also claims that "the environmentalists" are to blame for decisions not to build more water storage systems, but he gives no evidence. This reminds me of the pernicious anti-environmentalist meme in Oz that all fires are because "the greenies" won't allow back-burning. I suspect it's equally stinky. Also Watts has a thread up gloating about how Mcintyre ruined some climate scientist's life. Truly, he is a scumbag. The last time there was a big fight over a damn project in CA, the environmentalists lost. There is currently a fight going on over management of water in the delta, but that isn't a storage issue so much as moving water around the state. When the whole state is in drought, it doesn't matter too much. Funny enough, a couple of weeks ago Tony posted a story complaining about a requirement in Chico to replace old-fashioned toilets with low-flow toilets. This is flat out crazy in CA where it amounts to denying that you live in a desert. He also posted a story on Friday which, IIRC, denied that the drought was all that bad. 2) Most of CA's water use goes to farming, farmers are hurting, since for them it isn't a question of low-flow toilets, but whether they stay in business or not. I suspect Oz farmers know this sort of issue. 3) Anthony's Intelliweather was/is located in Chico, CA, at the North end of the Central Valley, amidst farm country. It's amazing how much rice is grown just south of Chico. Most people would think of that as crazy: trying to grow rice in a desert. It's almost as crazy as growing cotton in the Valley of the Sun, one of the main reasons they ran an open ditch through the desert. California? Let them eat cactus.